Want to know how to achieve pure self-improvement? Watch your infant child, says Kuwana Haulsey in her inspirational book. Watching a child open a gift when they are still young enough to be enthralled by the box it came in reminds one of the innocence, wonder, trust, and spirit of fun that fades with age. 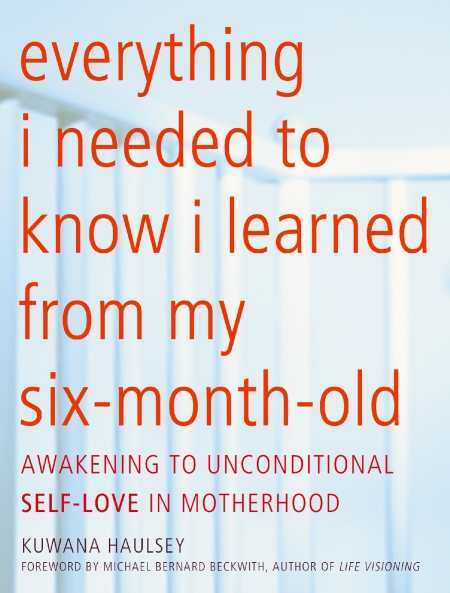 Novelist and freelance journalist Kuwana Haulsey brings these emotions to life in her memoir Everything I Needed To Know I Learned from My Six-Month Old: Awakening Unconditional Self-Love in Motherhood. Thirteen lessons, as the author titles them, lead the reader from the moments before Haulsey’s labor through the seventh month of her son Kingston’s life. Each chapter is indeed a lesson in learning, through the eyes of a child, how to find meaning, centeredness, self-love, and sanity during the most chaotic times in a new mother’s life. Parenthood is not required because the feelings are universal and inspirational. As the contractions intensify and labor continues hours on end, a midwife suggests the author needs to let go, to be aware of her feelings and what is holding her back, holding back the birth of her son. “But what would happen if I could stand still long enough to see myself truthfully, as the person I was in the moment, rather than who I thought I was based on who I believed I’d been in the past?” One does not have to be a mother or a woman to think about this. Many of us are running so fast that we forget to check in with ourselves; so busy checking email, voicemail, and a slew of social media that we forget to look within, take our own temperature and see if life is proceeding according to plan. Writing about success and failure, Haulsey shows us that babies do not think in those terms. Instead, they build upon each experience without judgment. “He was, at every moment, in the process of developing new skills, while simultaneously deepening his mastery of other skills,” the author writes of her son. Haulsey is the author of two novels, Angel of Harlem and The Red Moon, and was a finalist for the Zora Neale Hurston/Richard Wright Legacy Award for Debut Fiction in 2002. She has taught writing at UCLA and Agape International Spiritual Center and has led seminars for the Pen/Faulkner Foundation and Rutgers University.